Hope: From Robe to Riches: The beginning of the journey. And a brief introduction to Design Anthropology and content for social media engagement. I am the child of an anthropologist. I didn’t know it at the time, but I grew up with an anthropological view of the world. Anthropologists are people who are interested in other people’s stories. From my childish perspective, my mum (the anthropologist) needed to be out in the world, hearing stories. I remember that whenever we arrived somewhere (and boy did we go to a lot of places) the first thing Mum would do was leave. Literally, throw her bag in the corner of the room and head out. To find people. I’d tag along, even though I really just wanted to be alone, to draw or play my guitar. The first person we would encounter would begin the story. The story of this outing. Anyone who was open to talking. But not random talking. It might start with “oh, that’s an interesting accent, where are you from?” People seem to love telling their stories. And Mum certainly loved hearing them. I must admit that more often than not, I did too. Before long Mum would know enough about that person to ask if they knew…so and so… Amazingly, they often did know that person, or someone close to that person. People seem to love working out who they know in common. Once that link was established Mum would have another friend for life. Their name and details would be filed in her memory for future reference. Then they would get back to the story. The art of conversation. It was never a diatribe or a monologue. (If it got to be like that, we would slip away politely and find someone else.) Usually it would be about important stuff. People try not to bore you. They try to tell you things you might be interested in. They assume you will be interested in the things they are passionately interested in. And they are usually right—at least if they are talking to an anthropologist. Being a bit introverted, I was always surprised at how easily people would reveal very personal things.They didn’t see us as strangers. There is a simple dynamic to sharing a story that builds a rapport, very quickly—and you become an un-stranger. When it comes to stories, anthropologists tend to go with the flow. Each person leads you through their tale and onto the next person. Important stories have followings. The purpose of anthropology is to follow the leads and uncover these stories. And to help to tell them. In my case, it helps to see the story. I am a visual person. Mum is the same. We are both artists. More than words and names, I tend to remember people’s faces and the places we met. And the bunch of images that flit across my mind (like a movie) during the conversations. For me a story becomes real and engaging if I can connect it with an image. 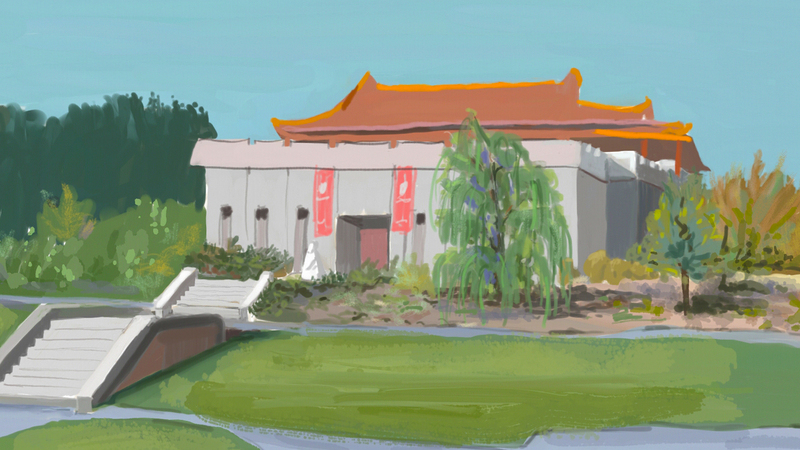 For example, one day I visited the Gum San Chinese Heritage Museum in Ararat. We were driving back from a family holiday in the Grampians when I saw this spectacular building on the road leading into Ararat town. “Wow — let’s go and see what’s in there.” The ladies at the reception were really welcoming. They showed my sons, husband and I through the exhibition. (Mum wasn’t there this time). They told us of the journey of 16,000 Chinese miners who walked from Robe to the Goldfields in 1857 and discovered Ararat along the way. That was interesting but it wasn’t until I sat down in their little cinema and watched a video of a boy saying goodbye to his sister on the shores of a lake—to make this journey—that it really started to mean something to me. I began to imagine what it would be like if my sons had to go away like that. That memory has been with me ever since. 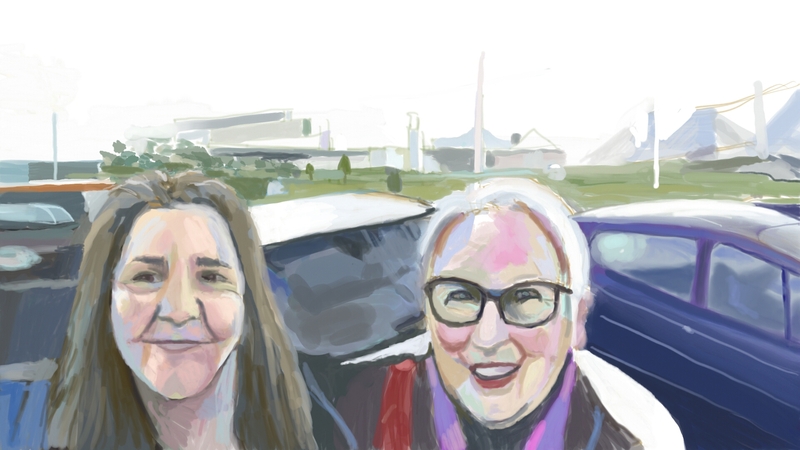 10 years later Mum and I set out to paint this journey. And that is how the Hope: From Robe to Riches story and exhibition eventuated. There are many parts to this story. These will be told here, post by post. Painting by painting.